Giant Saturn, the outermost planet visible to the naked eye, spends some two and a half years in each sign, taking about twenty-nine years on his journey around the zodiac. Saturn's most distinctive astronomical feature is that magnificent set of rings, but Saturn is also the centre of a swirling mini-solar-system with dozens of small moons. The largest of these moons, Titan, is bigger than Mercury or Pluto and possesses a dense atmosphere. The weirdest is Iapetus, which some claim to be an artificial satellite, due to its several anomalies. 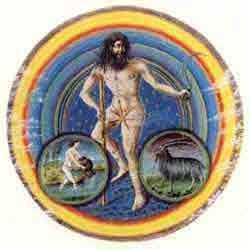 Astrologically the planetary Lord of Aquarius and Capricorn, Saturn, a harvest god, is known as the grim reaper – hence his exaltation in Libra, the sign of the harvest – yet in Ancient Rome the mythical age of Saturn's reign was envisaged as a golden age of happiness, without theft or servitude, and without private property. This prehistoric era was celebrated in Roman times at the darkness of the Winter Solstice, when laws and customs were turned on their heads at the Saturnalia. This festival commemorated the time of chaos before the Sun is reborn. Our era has incorporated these celebrations into the Christmas festivities. In mythology, grim Saturn castrated and overthrew his father, Uranus, but he also devoured his own children, for it was prophesied that one of them would destroy him. Indeed, he was eventually overthrown by his mighty son, Jupiter, heralding the beginning of civilisation. Traditionally described as the "Greater Infortune" (or "Greater Malefic", Mars being the "Lesser Malefic"), Saturn rules the responsibilities, restrictions and limitations we are apt to encounter, and the lessons we must learn in life. He does not deny or diminish imagination, inspiration, spirituality, or good fortune, but he does demand that these things be given structure and meaning, for he also governs tact, steady thought and serious contemplation. Saturn rules sorrow and regret and things connected with the past, for suffering is the doorway to wisdom. The karmic lessons we have come to experience and overcome in this lifetime are expressed by Saturn, the karmic initiator of the zodiac. These are often restriction or oppression in relationships; chronic debilitating conditions in health; old age, poverty and other difficult circumstances in material life. Saturn rules old people, restrictive situations, the common people, the working classes, inflexible authority and chronic, hard-to-shift disorders. Saturn's placement in the chart reveals the areas of life wherein we must undergo these karmic tests, but his condition by sign, house and aspect shows whether or not we may be cast down, or exalted by his influence, as a well-placed Saturn is an influence that can bring supreme success. Patience and thoroughness will generally offset the more problematic influences of Saturn, at least in terms of the anxiety they create, because Saturn rarely troubles those who are straightforward, systematic, and above all, patient. Each twenty-nine years naturally presents us with the challenge to rise to new levels of awareness, or face the consequences of having failed to gain the wisdom required so to do. When Saturn in the heavens returns to the zodiacal degree where he was placed in your birth chart, you are said to be experiencing what astrologers call your Saturn Return – one of the most important times of your life. It only happens once every 29 years, so at around age 28-30, 57-59 and (if you live long enough) 86-88 you have a Saturn Return. This signifies a time of transformation, an emotional transition from one life-phase to the next. The first Saturn return (around age 28-30) marks the transition from the Phase of Youth to the Phase of Maturity; the second from the Phase of Maturity to the Phase of Wisdom. The last one, if reached, seems usually to mark the transition either to the next world or else back to a second childhood! As the Saturn return approaches, often our lives seem to speed up, as if hurrying to clear out old baggage from the past, to lighten the load for the next stage. Important things that either finalize old issues, or prepare the ground for new developments tend to occur with increasing frequency. For those who are unprepared, this is often a time of severe suffering, as we struggle to understand the slings and arrows of outrageous fortune that seem to be aimed squarely at our hearts. Indeed, relationships and major life-decisions are all too often the focal points for this clearing out of karmic baggage. Click here for more on the Saturn Return. Ancient astronomers, starting at least with Pythagoras, held that the Earth was the centre of the universe and that the planets and stars occupied positions in a series of concentric, crystal spheres surrounding the Earth. Each sphere corresponded to a note in the musical scale. The spheres rotated and the subtle sound generated was called the Music of the Spheres. By attuning to the music of the spheres, one could place oneself into harmony with the cosmos. The music of the spheres is more than a beautiful poetic intuition. The dynamics of the solar system, first laid bare by Kepler's mathematical genius, are directly analogous to the laws of musical harmony. Interestingly, modern scientists have determined that planets broadcast unique radio signal patterns, which when translated into audible frequencies, make good listening. Thus planets could be said to "sing". Check out the "Sounds of Saturn", recorded by the Cassini-Huygens mission. If the embedded sound controller does not show on your browser, click here to listen to the "Sounds of Saturn". Saturn enters Virgo on September 2, 2007 for a lengthy stay. Click here for the prognosis!